Confederate Louisiana Officer's Sword belt with plate on original leather. 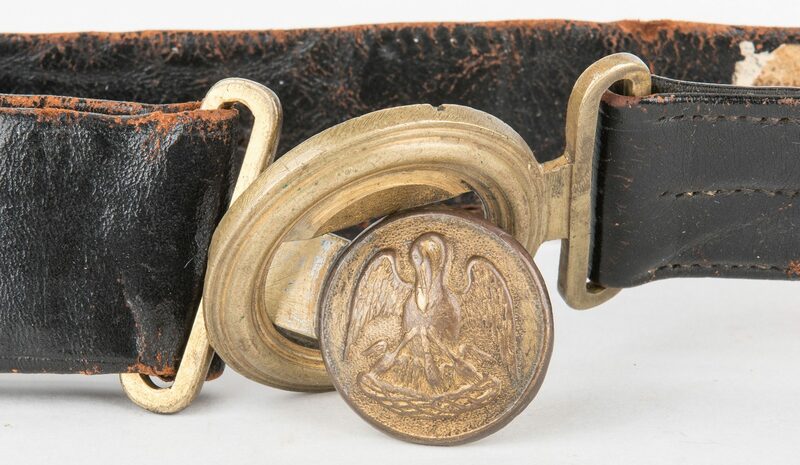 2-piece gilt cast brass waist belt plate with round keepers, applied die-struck tongue medallion depicting the state seal of Louisiana, a pelican feeding her young, surrounded by concentric rings to wreath. 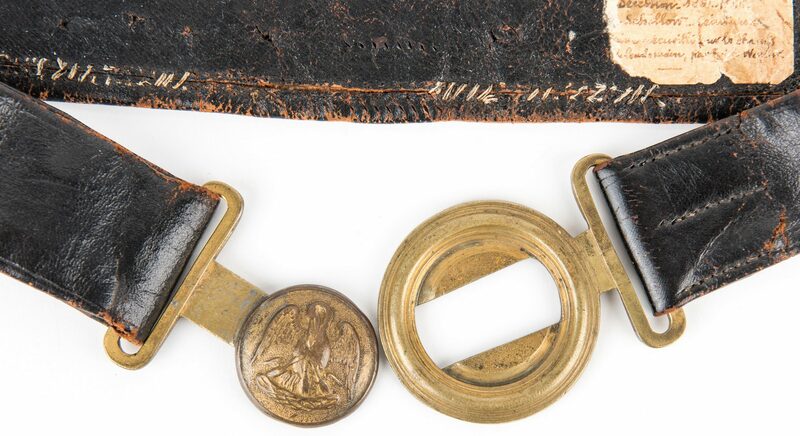 Partially illegible tag affixed to the inside of the belt which indicates capture at Shilow (Shiloh). Includes retail listings from Shannon Pritchard, Old South Military Antiques and Cliff Sophia, CS Arms with additional photographs. Plate approximately 52 mm (2.05") (53 mm tongue (2.09")) x 92 mm (3.62"). Wreath height Ð 57 mm (2.24"). Belt length approximately 31". Provenance: Shannon Pritchard, Old South Military Antiques. Purchased from Cliff Sophia, CS Arms. Estate of Jim Maconkey, Landrum, SC. Note: Thought to be made by Dufihlo of New Orleans. See: "Confederate Belt Buckles and Plates" by Steve E. Mullinax, 1999, page 151-154. CONDITION: The buckle exhibits fine untouched patina; the belt is solid and pliable but does have two partial tears that have been repaired. The belt originally had sword hangers which were removed at some point.